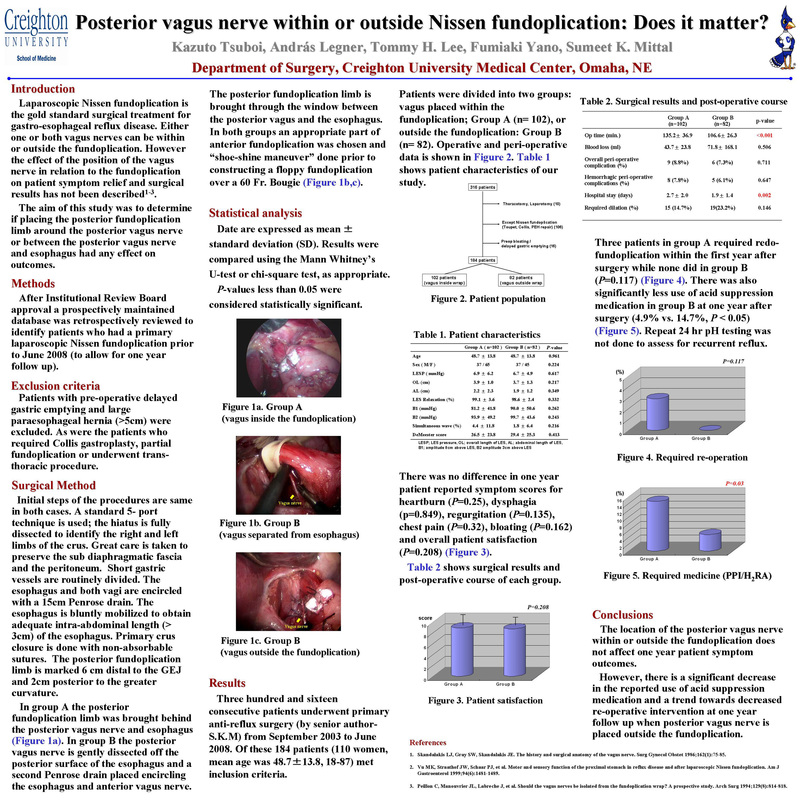 Posterior Vagus Nerve Within or Outside Nissen Fundoplication: Does It Matter? Background: Laparoscopic Nissen surgery is the gold standard surgical treatment for gastro-esophageal reflux disease. Either one or both vagus nerves can be within or outside the fundoplication. The aim of this study was to determine if placing the posterior vagus nerve within or outside the fundoplication had any effect on patient symptom relief. Materials and Methods: After Institutional Board approval the prospectively maintained database was retrospectively reviewed to identify patients who had a laparoscopic Nissen fundoplication one or more years ago. To decrease variability patients with pre-operative delayed gastric emptying, a large paraesophageal hernia, an intra-thoracic stomach, those requiring a Collis gastroplasty, a partial fundoplication or a trans-thoracic procedure were excluded. Results: From September 2003 to June 2008 316 consecutive patients underwent primary anti-reflux surgery, of these 184 patients (110 women, mean age was 48.7±13.8, 18-87) met inclusion criteria and were divided into two groups: vagus placed within the fundoplication; Group A (n= 102), or outside the fundoplication: Group B (n= 82). The anterior and posterior vagus nerves were identified and carefully preserved in all patients. There was no difference in one year patient reported symptom scores for heartburn (p=0.25), dysphagia (p=0.849), regurgitation (p=0.135), chest pain (p=0.32), bloating (p=0.164) and overall patient satisfaction (p=0.208). Three patients in group A required redo-fundoplication while none did in group B (p=0.117). Group B required significantly less acid suppression medication post-operatively (4.9% vs. 14.7%, p < 0.05). Conclusion: The location of the posterior vagus nerve within or outside the fundoplication does not affect one year patient symptom outcomes. However, there is a significant decrease in the use of acid suppression medication and a trend towards decreased re-operative intervention when the posterior vagus nerve is placed outside the fundoplication.